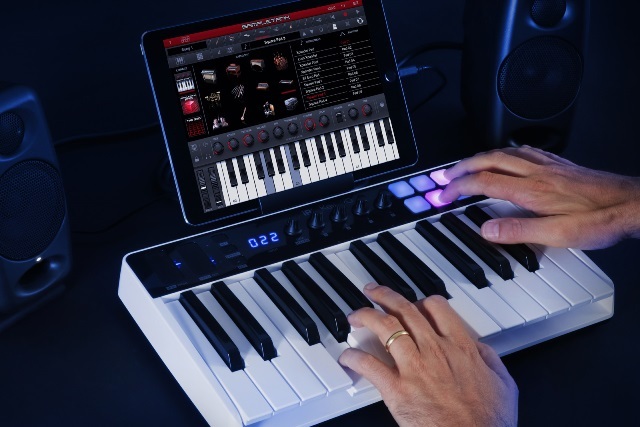 On the heels of a somewhat secretive video IK Multimedia put out to introduce it’s newest product a week ago, what they were teasing is the new iRig Keys I/O, an all-in-one music production station that goes anywhere you want. For a portable keyboard controller/music production station, on first glance, it looks pretty cool, but what’s under the hood packs a hefty punch. According to IK Multimedia it’s a “Pocket-sized mobile studio for all platforms that offers high-definition audio I/O, professional quality preamp, MIDI input/output, device charging and a huge software bundle.” There’s a lot going on here, especially since it comes in either 25 or 49 full-sized keys for iOS, Mac and PC, which makes this device very intriguing and something that for a grab-and-go device to do, is worth getting excited about! August 24, 2017 – IK Multimedia is proud to introduce iRig Keys I/O, the new breakthrough keyboard controller range featuring a built-in audio interface. It will be available in October 2017 and is now open for pre-order. The only keyboard controllers with 25 or 49 full-size keys to integrate a professional high-definition audio interface, iRig Keys I/O features 24-bit audio up to 96kHz sampling rate, a combo input jack for line, instrument or mic input with phantom power, balanced stereo output and high quality 1/8″ headphone output ideal for use with the latest Apple® devices like the iPhone® 7. iRig Keys I/O also includes all the controls users would expect from a premium keyboard, including velocity sensitive multicolored pads and programmable touch-sensitive sliders, buttons and knobs in an ultra-portable package that includes everything needed to create complete music productions and is unmatched for speed and simplicity to connect and set up. iRig Keys I/O is the only controller range currently available on the market today featuring a professional 24-bit, 96kHz capable audio interface. This keeps cabling to a minimum and makes setting up as fast and easy as just plug and play. For recording the combination input handles 1/4″ or XLR sources and provides the best possible audio quality with a Class A preamp for dynamic and condenser mics (including 48V phantom power), to line instruments along with guitars and basses. When used in live performances the 1/4″ balanced stereo output allows for long cable runs directly to a PA or mixer which is perfect for keyboard players and DJs. All of this makes iRig Keys I/O the ideal creative tool for studio or live use, in any situation, providing a solution that is more convenient and affordable than having to buy a controller and audio interface separately. Starting with a fast synth-action keybed that improves on all previous IK keyboards, iRig Keys I/O includes all the controls expected from a premium controller and more. Both models feature a volume/data push knob, 4 touch-sensitive knobs on 2 banks (acting as 8 total controls) and 8 multicolored LED velocity sensitive pads. There are also 2 fully programmable touch control strips acting by default as Pitch and Modulation controls. A complete touch sensitive transport and button section rounds out the controls available. All knobs, sliders and buttons are touch-sensitive using capacitive technology for ultra-fast action and immediate feedback, displaying the related parameter value just with a simple touch. Being certified Apple MFi hardware (Made for iPhone and iPad) and thanks to the on-board audio interface, iRig Keys I/O works out of the box with all iOS devices with a Lightning port, including the latest generation iPhone 7 that does not have an audio output jack. The included Lighting cable allows for easy plug-and-play operation with Apple iOS devices and the USB cable connects Mac and PC computers. iRig Keys I/O also works seamlessly with popular Digital Audio Workstation (DAW) software like GarageBand®, Logic®, Ableton® Live™ and more. iRig Keys I/O 25 and 49 key versions are the smallest controllers with full-size keys on the market today. This is a great advantage when working in studios or environments where space is at a premium and ideal for the traveling musician, not only for their ultra-compact size but also because they are 25% lighter than the nearest competitor. Furthermore, iRig Keys I/O can be powered by USB, an optional external power supply (that simultaneously charges an iOS device) or with 4 AA batteries for mobile music production anywhere. With over $/€550 (in the 25-key version) and $/€750 (in the 49-key version) worth of IK software and apps, iRig Keys I/O includes an unrivaled selection of software allowing for complete productions when combined with a DAW or free composing and recording software like GarageBand. Included in both 25 and 49 key versions is Ableton® Live 9 Lite™ digital audio workstation, SampleTank 3 sound and groove workstation with over 43GB and 5000 sounds, T-RackS 4 Deluxe mix and mastering suite with 9 EQ and dynamics processors, and the Syntronik Pro-V vintage synthesizer. Plus, iPhone and iPad users receive the full version of SampleTank. Additionally, the 49-key version comes with Miroslav Philharmonik 2 CE orchestral workstation for Mac/PC and the mobile edition for iOS. iRig Keys I/O will be available in October 2017 and can be pre-ordered now from the IK Multimedia online store and IK authorized dealers worldwide for the remarkably affordable price of only $/€299.99* for the 49-key version and $/€199.99 for the 25-key version. In addition to the massive bundle of included software, iRig Keys I/O also comes with 4 x AA batteries, Mini-DIN to USB and Mini-DIN to Lightning cables and a device stand for iPhone and iPad.